Obstructive sleep apnea (OSA) is a chronic sleep disorder associated with snoring and pauses in breathing. Treatment is essential; doing so will eliminate daytime drowsiness, and help prevent a number of potentially serious medical complications including heart attack, stroke, high blood pressure and diabetes. While Continuous positive airway pressure (CPAP) | Wikipedia therapy is the preferred method of treatment, not everybody is able to tolerate sleeping with a mask attached to a machine that delivers bursts of air to the throat. Oral appliances are an alternative for these patients. They work by either moving the lower jaw forward to keep the airway passages open, or holding the tongue in place to prevent it from falling backward and blocking the airway. 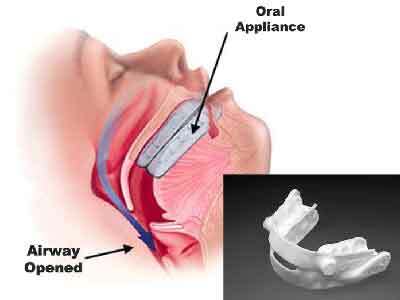 Oral appliances are most effective for patients with mild to moderate sleep apnea. Oral appliances may be either fixed or adjustable and are available in many different styles with as many as 40 different patents in existence. Some are custom designed to fit the individual’s mouth after impressions are made, and must be prescribed by a dentist, oral surgeon or ENT physician with sleep medicine experience. Others are considered one-size-fits-all. There are several advantages to using oral appliances over other Sleep apnea treatment | National Sleep Foundation methods. They are easy to use, inexpensive, and effective for treating a number of sleep disorders including snoring, upper airway resistance syndrome, and obstructive sleep apnea. Continuous positive airway pressure (CPAP) is the preferred method of treating sleep apnea. This device pumps controlled bursts of air into your throat while you sleep, delivered through a mask that is worn over the nose and mouth and attached to a machine. This keeps your upper airway passages open, preventing apnea and snoring.